Northdixie Designs: Safe AND Happy? I am not a risk taker. In fact my family makes fun of me about that. A mother of special needs children said recently that she just wanted her kids to be "safe and happy". I totally get that! I think in most moms there is a "keep my kid safe at all costs" gene. But this comment got me thinking about risk-benefit analysis. That, and applying for term life insurance where I was asked if I did sky-diving and bungee jumping. Er....no. Everything we do in life has a risk and possible benefit to it. Some people will feel happier and enjoy life with more risk and others will feel happier with less risk. But even the pursuit of safety can have a cost if carried to an extreme. Example: As people age, they can become so afraid of falling that they stop moving. And there is a danger to lack of movement, too - you get rusty, it's harder to move, so you have less balance. As a result, you may be more at risk of falling - the very thing you were trying to avoid. There is a cost to choosing the easy route, the safe route. And there might be a cost to the more risky route. 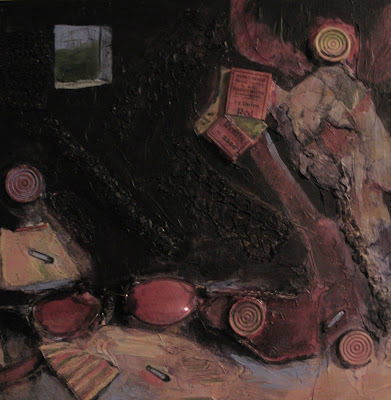 For the artist, branching into a different medium and focus, when you are known for painting a particular type of work, might mean a loss of sales. But a more exuberant feeling about your art. For a parent, setting aside your own need to keep your kids totally safe might result in them learning more and being happier. See that picture above? There was some risk involved, but there was also learning how to work together and how to cantilever a canoe with people to transform it into a slide. Lots and lots of physics involved. I think my artwork used to have more variety and risk involved. I was looking through some of the old posts and saw this painting. It's not a complete success but I remember how much fun I had trying something new. 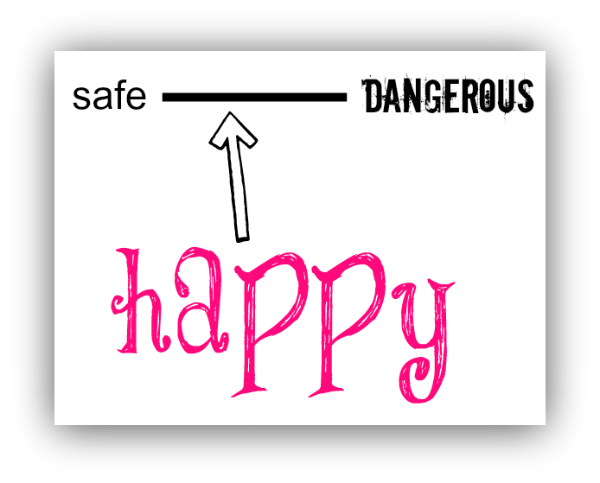 Figuring out where the happy spot is on the continuum between safe and danger is stuff of life. Carry on.